The Historic Homes Preservation Group, associated group of the North Manchester Historical Society, recently received an interest-free loan for $40,000 from Indiana Landmarks. The loan will be used in the HHPG’s latest renovation project, a home located at 512 W. Third Street in North Manchester. As an Affiliate Member, the North Manchester Historical Society is eligible to apply for loans from Indiana Landmark’s Endangered Places Loan Fund. The loans are interest-free for one year, and then charge a minimal interest. The HHPG plans on finishing the renovation, selling the property, and paying back the loan within the interest-free period. The loan gives the group the capital to complete the renovations. While the group has slowly developed a nest egg that can be used to purchase promising properties, the costs of renovation may not be recovered until the property is sold. The HHPG also received state support through the Department of Natural Resources a few years ago for their project to stabilize and partially renovate the Cigar Factory, a familiar downtown North Manchester landmark. Other properties renovated by the downtown Rice House, and homes on Mill, South and Grant Streets. The group seeks to save and restore “homes of character or history.” They are particularly pleased that three of the homes they have renovated have been sold to young first-time homeowners who had not considered that they could own an home and build equity for the same amount or less than they were paying in rent. 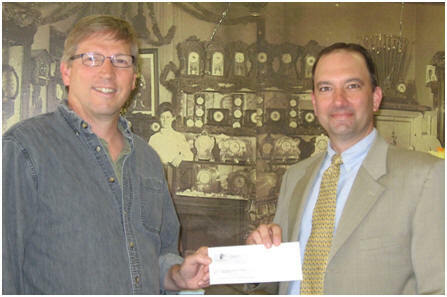 Jim Chinworth (left) of the North Manchester Historic Home Preservation Group receives a $40,000 interest-free loan from Todd Zieger (right), Director of the Northern Regional Office of Indiana Landmarks. The loan will be used to cover renovations to a home the group is restoring at 512 W. Third Street. Repayment of the loan will occur once the restored house is sold.